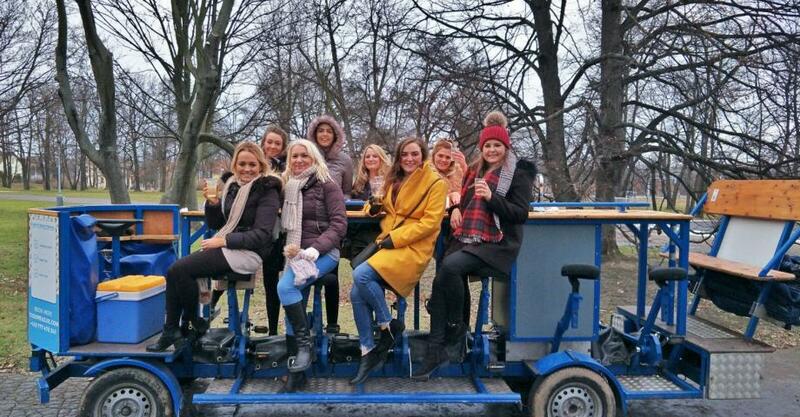 Relax with your friends and prosecco drinks on this fun bike tour and enjoy stunning views of Prague. 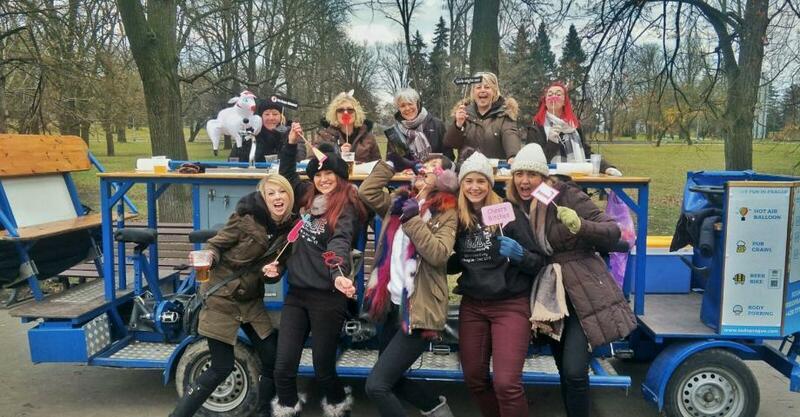 Scouting Prague bars for your hen party? 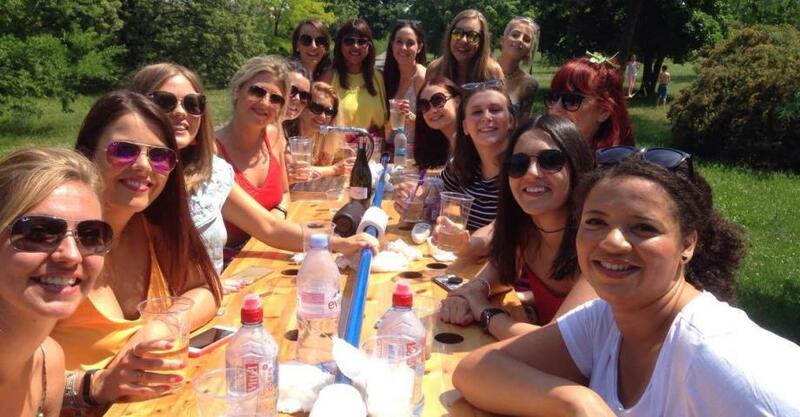 Go on a bike trip with a refreshing glass of prosecco in one hand instead! How stylish is that? 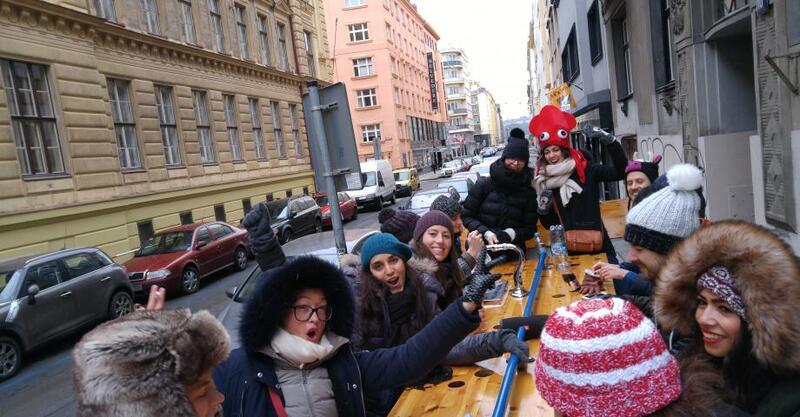 Did you know that Prague tours can be great fun? You bet! 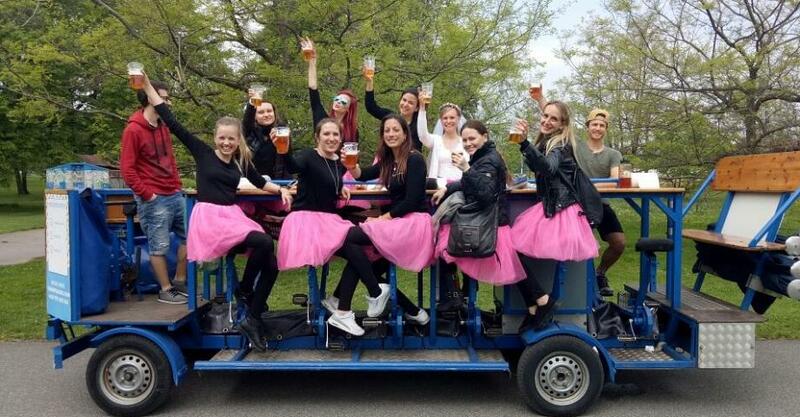 That is if you know how to choose the best: Book your Prosecco bike ride and bring a group of friends to have fun riding together a huge bike through the wonderful park of Letná. Enjoy a nice day out with funny activities, refreshing sparkling drinks and Prague sightseeing on the way in the company of your friends. The activity is suitable for groups of 5 to 9 and 10 to 16 people. Sober driver, hostess, prosecco consumption and non-alcoholic drinks (+ wine, beer, cider on demand) included. Book now only with a deposit, and pay the balance later on the spot. 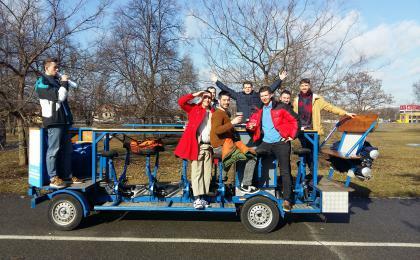 Let's have outdoor fun and drink prosecco while pedalling a huge bike which can carry up to 16 drinking persons! You will capture many great moments while fighting with pedals. And moreover, you will enjoy one of the most beautiful views of Prague on our way. Bring your own music mix on USB, or use Spotify to have the perfect background for your ride. When it gets dark, we will lit the party lights up for you. 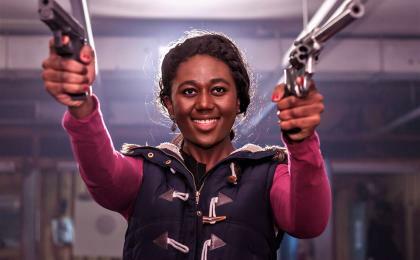 As this activity includes alcohol consumption, it is for 18 years and older only. Please note that the provider won´t let you on the bike if you are under the alcohol or drugs! The ride takes place in any weather, but of course you will enjoy it best in a sunny day. What if it rains? No worries, the ride is still on. The beer bike has umbrellas. And in case of a big storm, you can either wait in pub nearby or we will try to reschedule your ride. The tour usually takes 80-90 minutes. You will take the ride with 6-9 other participants. No spectators are allowed. No special clothes recommended, just wear something comfortable and warm in winter. As this activity takes place near city centre, we recommend you to get taxi there rather than going by car, as you can find it difficult to find parking space. TAXI price is under 10 EUR (cca 250,- CZK) from Prague centre. Distance from Prague centre: 2,5 km. 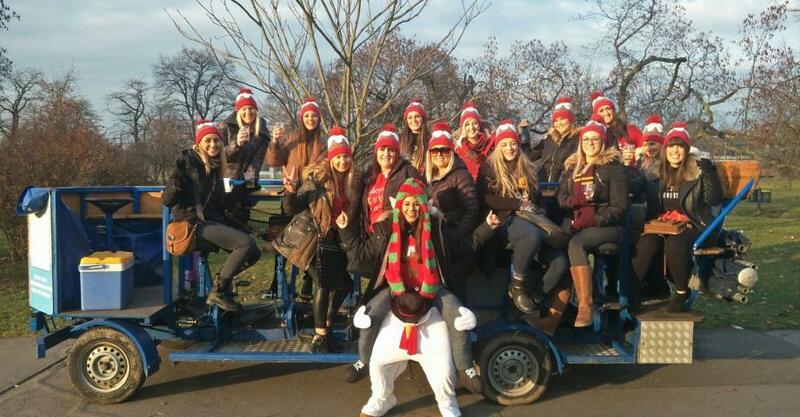 This activity takes place near Prague centre and is easily accessible by public transport. For details see Google maps. Travel time: around 15 minutes, Ticket price: 1 EUR (24,-CZK) per ticket. If you like walking, you can get to this activity easily on foot. Distance from Prague centre is 2 km. It should take you 25 minutes by foot to get there from city centre. See Google Maps.